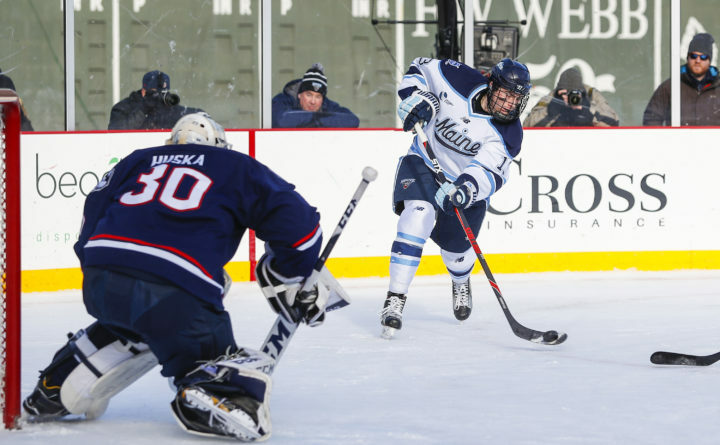 Nolan Vesey of the University of Maine fires a shot on University of Connecticut goaltender Adam Huska during Saturday's "Frozen Fenway" game at Fenway Park in Boston. The Black Bears won 4-0. Nolan Vesey saw the handwriting on the wall. The former University of Maine hockey left winger knew he would face an uphill climb to play in the National Hockey League for the talent-laden Toronto Maple Leafs, the team that drafted him in the sixth round (158th overall) in 2014. So he was prepared to wait until Aug. 15 when he would become a free agent and could sign with another team. But the recently graduated Vesey instead got traded to the Edmonton Oilers last month for a conditional seventh-round pick in 2020. He signed a two-year, two-way contract with the Oilers and is participating in their development camp. A two-way contract pays a player a certain amount if he makes the Oilers roster and a much lower salary if he plays in the American Hockey League. Edmonton’s AHL affiliate is in Bakersfield, California. He and the Maple Leafs agreed a change would benefit him. “I wanted to go to a place where I’d have a good opportunity to play. I wanted to give myself the best chance to make it to the NHL. The last thing I wanted was to be was in and out of the lineup with an AHL team,” added Vesey. Toronto is coming off a season in which it set the franchise record for points (105) and wins (49) in a season while Edmonton finished with 78 points and didn’t make the playoffs. Vesey said he discussed his situation with his agent, Peter Fish, and his family. The 6-foot-1, 198-pound native of North Reading, Massachusetts, concluded his UMaine career with 39 goals and 43 assists in 145 games. He posted a career-best 25 points last winter, which tied him for third on the team. Vesey registered 11 goals and 14 assists in 37 games. UMaine head coach and former longtime NHL assistant Red Gendron said Vesey made a smart decision and that he improved his game every year at UMaine. Gendron said Vesey will have to elevate every part of his game as he transitions to pro hockey. Vesey has been training with renowned strength and conditioning coach Mike Boyle in Massachusetts along with his brother, New York Rangers winger Jimmy Vesey. Nolan Vesey said his career at UMaine was challenging. “The first three years were pretty trying but we took some big steps in the right direction my senior year,” Nolan Vesey said. “I met some of my best friends there. I’m going to miss it. But I’m excited to get my pro career started,” he said. Nolan Vesey is one of eight current and former Black Bears in NHL development camps this summer. Chase Pearson and Patrick Holway are in Detroit Red Wings camp, Jeremy Swayman and Mitch Fossier are in the Boston Bruins camp, Brady Keeper is with Minnesota, Stephen Mundinger is with the New York Rangers and Eduards Tralmaks is with Ottawa.